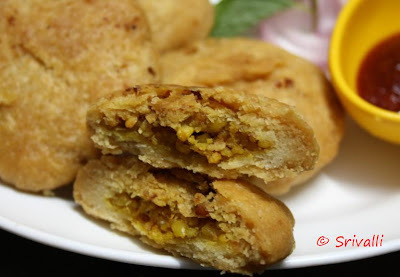 Spice your Life: Khasta Kachori / Moong Dal Kachori - Step by Step Recipe ~ Indian Cooking Challenge! 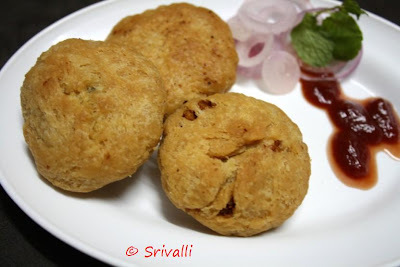 Khasta Kachori / Moong Dal Kachori - Step by Step Recipe ~ Indian Cooking Challenge! 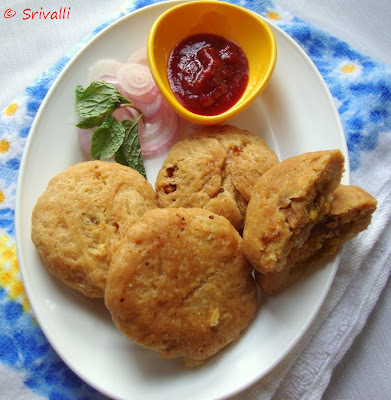 Kachori, a word that conjures lot of lovely memories spent during college days. 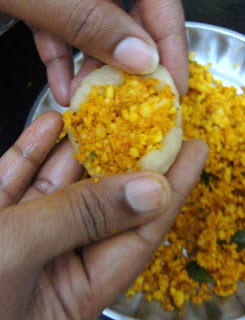 This was one snack that I got introduced by my North Indian friends. 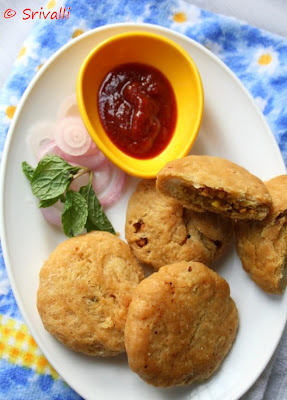 Once when we went for a movie, my friend got us home made Kachoris that her mom made. They were so crispy and tasty, the taste that I could never forget. I again got to taste some authentic kachoris during my visit to Delhi and realized that each one vary based on what goes in. For this month of Challenge, I wanted to make some savory snack and was wondering what will fill that bill. It was coming back to Samosas. Yet I didn't want to make these as I regularly used to make at home. Then during my chat with Medhaa, we naturally moved to discuss what could be the next one on Indian Cooking Challenge and we finally banged on Kachoris. I asked if her Mom has an authentic recipe and she said she can get one from her Aunty who makes some lovely Kachoris. Medhaa not only got the recipe from her Aunt, she also tried recipes from Tarla Dalal. Finally she mixed both recipes and came about her own. So for this month we have a tried and tested recipe from Medhaa of Cook with Love! Thank you Medhaa for the recipe. 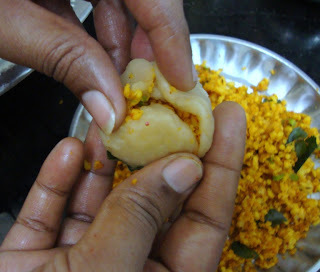 We choose three different fillings - Moong Dal Filling, Peas Filling and Onions. Members had the choice to make any one or all the three. 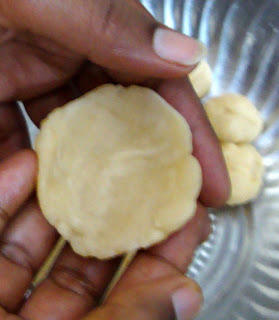 Step by Step Pictures for Making Kachoris! 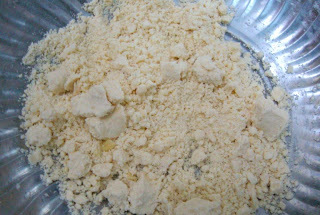 For the dough, take the measured flour add oil/ghee, salt and mix till you get a crumble like above. 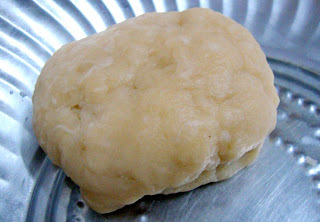 Knead it using very little water into a tight dough and cover it with a wet muslin cloth for 1 hour. Meanwhile soak 1 cup Split Yellow Moong dal with enough water for 1 hour. The coarsely grind, you should be finding the dal half full. Heat a kadai with oil and fry all the ingredients listed under the Filling for Moong Dal filling. Fry till you get a dry filling like the above. 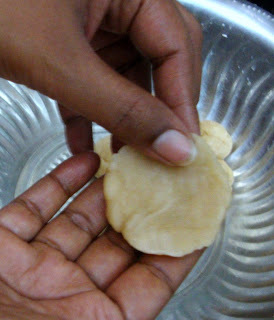 Pinch a small ball from the dough and flatten the sides as in the picture. End of it, you will have a small bowl shaped dough. Gently close from the sides and ensure the filling is covered on all sides. On a flat surface, gently press it down. Make sure you don't press it very hard, else the filling will come out. When you have enough to fry, heat a kadai and simmer to low when the oil is really hot. Fry in batches depending on the oil in the pan. Turn on the other side and cook evenly on both sides. This takes about 20 - 30 mins for each batch. Once it is cooked on both sides, drain on a tissue paper. The dough is the same for all the fillings. Frying time for the Kachoris - 20 mins for each batch app. 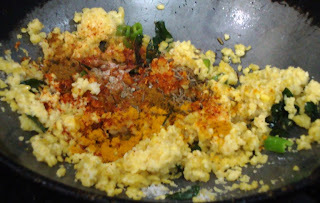 Mix the flour and salt, Add the oil/ghee and mix till you get a bread crumbs texture. Slowly add water and make a soft dough. Knead well for about 8 minutes. Cover and keep aside to rest for at least half hour. 1. 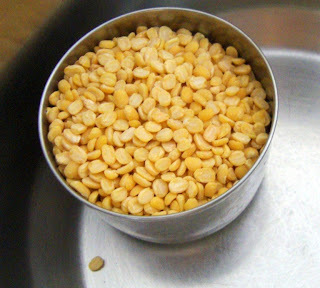 Wash and Soak dal in water for at least 1 hour. You can go upto 4 hours not more. 2. Drain the water well. 5. Add the hing and cumin seeds. 6. Once the seeds splutter add the curry leaves. 8. Lower the heat and keep stirring for 5 minutes till the dal stops sticking to the pan. 9. Cook for another 10 minutes on low till the dal turns slightly brown. 10. Add all the masalas. 11. Cook for few minutes till the aroma of the spices hit you. 13. Remove from heat and keep aside to cool. The fillings have to be really dry if not when rolling they will ooze out when rolling. Adjust the masalas according to your taste. 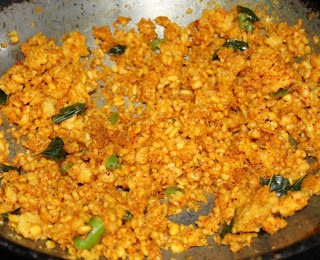 What is given in this recipe is spicy to the extent one can still enjoy. 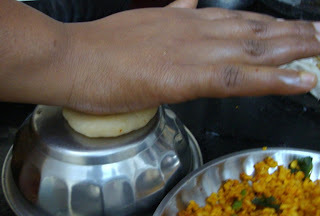 If you try to press out using a rolling pin, the filling may come out and make holes in the kachori. So it will have to be just pressed out using your palm. 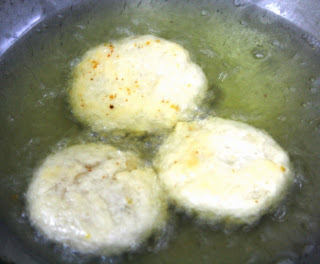 Fry the kachori's on medium low to get a crisp outer layer, that is the key. For people using electric stove, the numbers can be going from 6 to 4. Coarsely grind the green peas,green chillies and ginger in a blender without using any water. Keep aside. Heat the oil in a pan,add the nigella seeds, fennel seeds, bay leaves and ground green pea mixture and saute over a very slow flame for 8 to 10 minutes. Add the chilli powder, garam masala, coriander and salt and saute for 2 more minutes. Remove the bay leaves and discard. Divide into 12 equal portions. Heat the oil in a pan. Add the nigella seeds, fennel seeds, bay leaves, green chillies and onions and sauté till the onions turn light brown in colour. 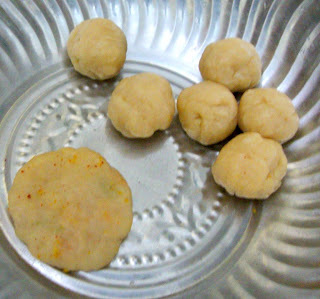 Make a small ball from the dough. Roll out into a 2 inch diameter circle. Or flatten the ball using your fingers having the center thick and sides little thin. Place about 1.5 tsp of the filling in the center of the rolled dough. Cover the filling with the dough by slowly stretching it over the filling. Seal the ends and remove excess dough. Repeat with all the balls and keep aside for 5 -7 mins. 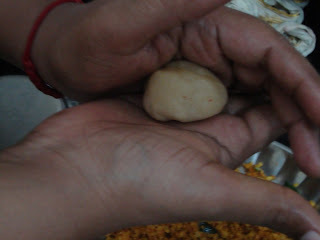 Then using your palm, flatten the balls by lightly pressing it, as using the rolling pin will make the filling come out. (See notes below). Keep aside covered. Repeat with the remaining dough. Meanwhile heat some oil for deep frying. The oil should not become smoking hot. Test to see if the temperature is right by dropping a tiny ball of dough and see if it is rising slowly to the top. 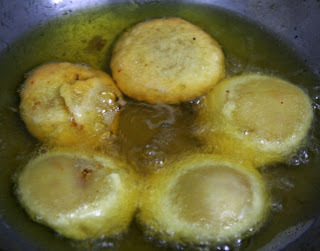 Drop the kachoris in batches of 3-4 gently into the oil. It should rise up slowly. If you don't want to use lot of oil, use just enough for two or three at a time and fry them. After it rises up (about 2 minutes), turn it over. Cook for about 6 to 10 minutes till the side down gets a golden brown color. This takes really long time to get cooked, so be prepared. Special notes to remember, I started with a smaller cup, but the dal after soaking was more than what was needed. So I had to make the dough then and there. Instead of oil as I previously kneaded, I added ghee. This resulted in faster dough. Since you anyway will cook this in sim, the cover will be crispy no doubt. So have a check on the dal you use. For the other filling I am not sure. Maybe I will check with others and update here. I must say of all the Challenges, I loved this the best. Maybe because I love savories or maybe I simply love kachoris. I am really trilled that I finally made this at home. I almost missed making it today, having since postponed till the very end. On my part, this reminded me so very much of my college days and specially one outing when my friend brought us homemade kachories. Finally after so many years, I get to make them myself! Today being sunday it was really so very hectic. But I was determined that I make it. With great difficulty I got the kids take their nap, as I planned it during that gap. After spending nearly 2 hrs making this, I was happy that it was a great hit. Everybody simply loved it. Infact Konda said I should make this everyday for it. I was glad that I made the other batch as parents really liked it very much too. This is surely something that I am going to make very often. I am sure everybody enjoyed making the kachories at home. 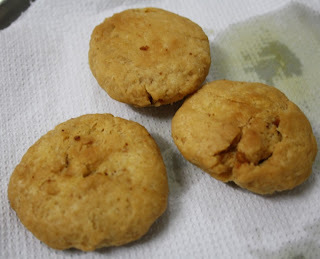 To all my ICC members, please link your Kachori post to Mr. Linky.